Fjeldså, J. 2004. 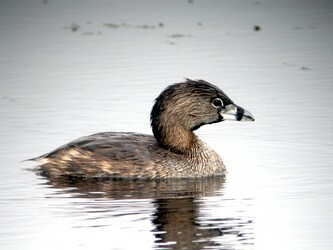 The Grebes: Podicipedidae. Bird Families of the World XII. Oxford University Press, New York. Konter, A. 2001. Grebes of our World: Visiting all Species on 5 Continents. Lynx Edicions, Barcelona. Livezey, B. C. 1989. Flightlessness in grebes (Aves, Podicipedidae) - its independent evolution in 3 genera. Evolution 43 (1):29-54. O’Donnel, C. and J. Fjeldså. 1997. 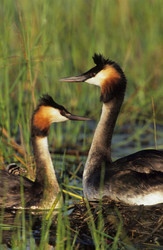 Grebes: Status Survey and Conservation Action Plan. IUCN/SSC Grebe Specialist Group, IUCN, Gland, Switzerland and Cambridge, UK. Ogilvie, M. and C. Rose. 2003. 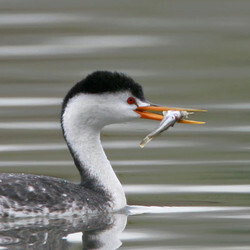 Grebes of the World. Bruce Coleman, Uxbridge. Grebe Videos. Internet Bird Collection. Page: Tree of Life Podicipediformes. Podicipedidae. Grebes. The TEXT of this page is licensed under the Creative Commons Attribution-NonCommercial License - Version 3.0. Note that images and other media featured on this page are each governed by their own license, and they may or may not be available for reuse. Click on an image or a media link to access the media data window, which provides the relevant licensing information. For the general terms and conditions of ToL material reuse and redistribution, please see the Tree of Life Copyright Policies.